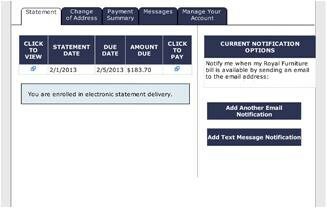 See registration information for Online Bill Pay below. If you have already registered, select Take me to sign-in screen instead. The Registration Page will be used to match your account number to your email address. Your account number may be located on your welcome e-mail or a recent payment receipt. After you have registered for online bill-pay, you can easily make your monthly payment from our secure bill-pay system. 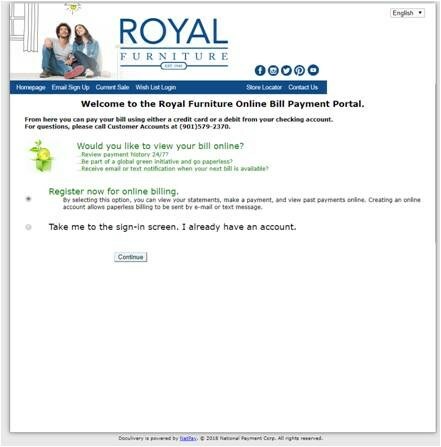 Visit payments.royalfurniture.com to post your payment. Print or view the current statement. You can also pay directly from the statement by choosing the Click to Pay option under Amount Due. Payments by electronic check, credit card, or debit care are accepted. Previous Balance: The amount due on the account prior to most recent payment. 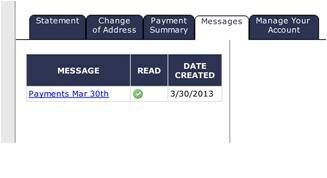 Last Payment: Amount and date the most recent payment posted on your account. Payments made after the statement date will not be reflected until the following statement. Balance: Total amount due including finance charges. Payoff: Payment needed to pay the account in full which includes rebated finance charges. Payoff must be received by the date listed. Current Payment Amount: Contractual monthly payment due each month for the term of contract. Past Due Late Fees: Amount of fees incurred for payments not received before the due date. Past Due Payment Amount: Total amount of contractual payments which are currently delinquent. 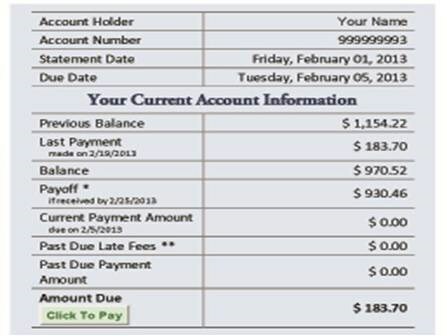 Amount Due: Total of current payment in addition to past due late fees and contractual payments. This is the payment amount needed to be current on your account. Update your address and phone number from this tab. Complete the required fields, then select Submit Address Change Request. Requests may take up to 5 days to process. Any payments made online will be listed. Payments made over the phone, via mail or in the store will not be listed. Are sent directly from Royal Furniture and includes payment confirmations and changes to your account. Your login ID, First Name and Last Name cannot be altered online. If that information requires correction, please contact (901) 579-2370. 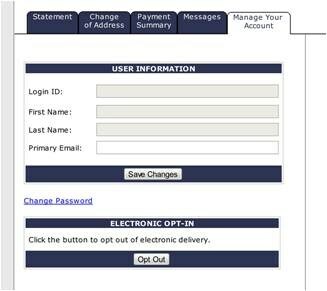 You may however change your primary email address from your Online Bill Pay portal. You can also change your password, which is recommended every three months. When you select Change Password, a window will open where you will be asked to enter and confirm the new password. Once complete, select Save Changes. If you have recently added to or reopened a closed account, you can associate your new account number with your existing user name and password. Select the Add Account button at the top right of the page and enter your new nine digit account number. Once you choose continue, the accounts will be linked. Under Statements, register more than one e-mail address for statement delivery. Receive a text message when your statement is available. Once the cell phone number is entered and cell phone provider is chosen. Text Message charges may apply from phone provider. Never forget to make a payment! Auto-Pay is a worry free way to ensure your Royal Furniture account is paid on time every month with just a few easy steps. All you will need to enroll is a checking or savings account with the account holders first and last name, the type of account, the bank account and bank routing number. 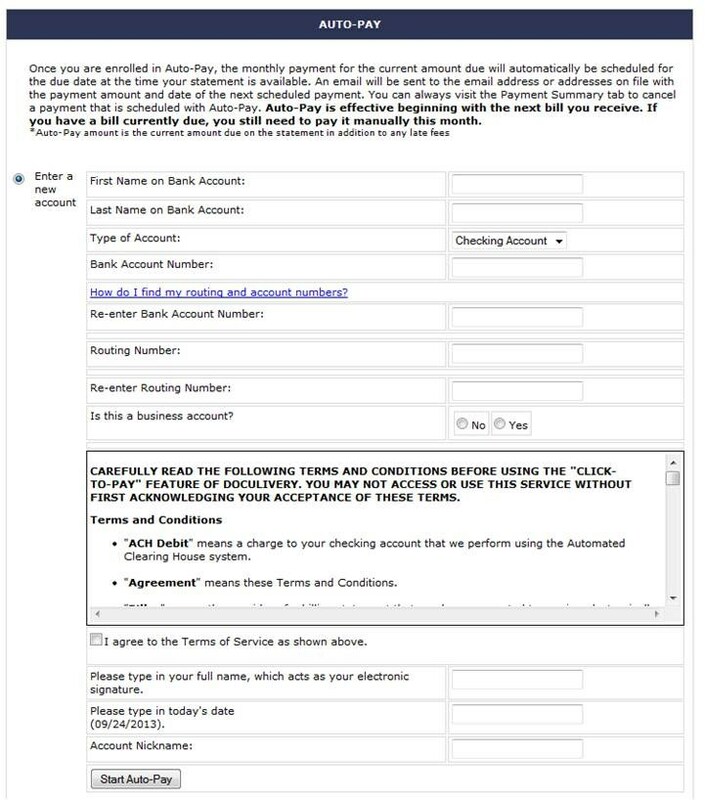 Once you electronically sign your name after agreeing to the terms of service, you will receive an e-mail to the email address or addresses on file verifying your enrollment in Auto-Pay at Royal Furniture. Is Royal Financing the same as Rent-To-Own? We encourage you to compare prices! Royal honors the lowest sale price when you finance with us. With most competitors, you have to pick financing or sale price, but Royal gives you both! Why can’t I get my merchandise same-day when I purchase with Royal Financing? Purchases made on a Royal Credit account may require up to 5 business days for processing before delivery or pickup can be scheduled. 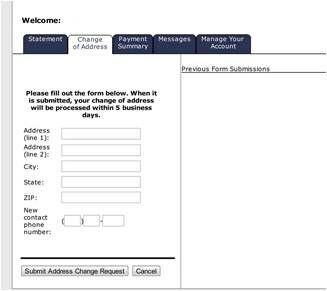 Pickup and Delivery appointment requests, even those notated on a purchase ticket, are not guaranteed until the credit application is fully processed; this includes contacting references and confirming proof of income. If you are unsure whether your application is processed and ready for pickup or delivery, please contact your sales associate to inquire. If my merchandise is backordered do I have to make my payments? Yes. It is extremely important that you make your payments as scheduled. Payment due dates are not dependent on merchandise delivery or availability. Failure to make on-time payments will result in late fees and could negatively impact your credit score. In certain circumstances, the store manager at the purchase location may authorize to postpone the first payment on the account to accommodate delayed merchandise. 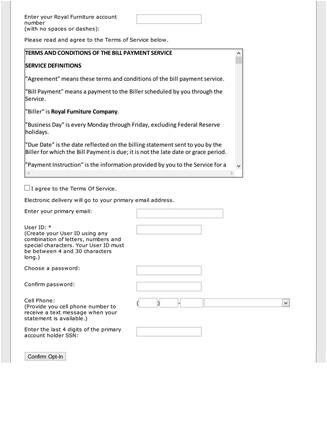 Such arrangements must be made prior to your first payment due date. Late charges will not be dissolved when such arrangements are requested after the payment due date has already been missed. It is the customer’s sole responsibility to keep track of and meet billing due dates. If my merchandise is damaged can I withhold payment until it is repaired or exchanged? No. It is extremely important that you make your payments as scheduled. Payment due dates are not dependent on the condition of your merchandise. Our warranty department is eager to help with services on damaged merchandise under warranty however we are not permitted to schedule service on accounts that are not current. If you withhold payment due to damaged merchandise, this will delay our ability to repair or replace the merchandise and will also result in late fees on your account and could negatively impact your credit score. If I sell my furniture can I transfer the contract to the new owner? No. Financing contracts are nontransferable. The payment responsibility remains with the person who opened the account. Payment Insurance is offered through Royal Furniture for eligible customers financing through Royal Credit. There are four types of insurance: Property, Life, AD&D, and Involuntary Unemployment. Each type of insurance available is intended to protect you, the buyer, in specific situations that would render you unable to fulfill your financing agreement. For example: with Property Insurance, if you were the victim of a house fire which destroyed your furniture, your insurance policy would pay off your Royal financing contract so that you would no longer be responsible for making those payments after the loss of your property. See sales associate for coverage details to find the right insurance policies for your needs. Policies underwritten by Life of the South and Lyndon Southern Financial. Can I add a new purchase to my financing account? Yes! Upon review of your account, our credit department may authorize an additional line of credit to your account. Our financing team is committed to helping you get the furniture you want, at a price you can afford. To consider additional financing, we will review your current balance, monthly payment to income ratio and other variables. Please see your sales associate to request an increased line of credit. Subject to credit approval, down payment may be required. Payment due dates are not dependent on merchandise delivery or availability. All financed merchandise will be subject to the original payment timeline, regardless of merchandise availability. Failure to make on-time payments will result in late fees and could negatively impact your credit score. Individual product units are not assigned to any purchase order until the customer physically takes possession of the merchandise. Royal Furniture does not guarantee availability of purchased merchandise at the customer’s request. In certain circumstances including but not limited to Layaway orders, Backorders or an order being placed and purchased but delivery or will-call pickup being deferred due to home renovations, relocation, etc., the inventory status of the purchased item or items is subject to change. Royal Furniture may postpone delivery or will-call availability of the item or items until they are back in stock. In the event that the purchased item has become discontinued and Royal Furniture can no longer fulfill the order, Royal Furniture will issue the customer a refund for the missing portion of his or her purchase, or authorize a reselection in the form of store credit for the equal value (purchase price plus sales tax) of the discontinued merchandise. If payments have been made toward the layaway purchase but are not yet complete, the refund or store credit amount will not exceed the amount that has been paid toward the merchandise by the customer. In specific circumstances, the store manager at the purchase location may authorize to post-pone the first payment on the account to accommodate delayed merchandise. Such arrangements must be made prior to first payment due date. Late charges will not be dissolved when such arrangements are requested after the payment due date has already been missed. It is the customer’s sole responsibility to keep track of and meet billing due dates.